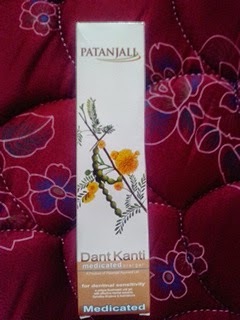 I am a regular user of original Patanjali Dant Kanti Toothpaste and have already reviewed it. I simply love Patanjali Dant Kanti Dental Cream since it takes care of my teeth very well. I have been using Patanjali ayurvedic toothpaste, since years. But this time I thought to try it in the medicated variant. There are 3 variants of Patanjali toothpaste, the original Dant Kanti Cleanser, the medicated one and a junior toothpaste for kids & children. Take a look at Patanjali Products List for more information on other Patanjali Products. What Patanjali Dant Kanti Medicated Toothpaste Claims? 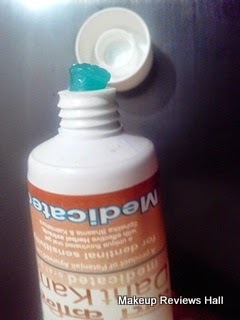 Patanjali Dant Kanti medicated oral gel. a product of Patanjali Ayurved Ltd. for dentinal sensitivity, a unique fluorinated oral gel with effective herbal extracts Sphatika Bhasma & Kalmishora. Tightens gums, Kills germs, Ends sensation. Suggested Use - To be used in the morning and before bed time with a soft tooth brush or as directed by the dental physician. Not recommended for children below 7 years. Not to be swallowed. Patanjali Medicated Toothpaste Price - Rs 45/- for 100 g.
Read Patanjali Kesh Kanti Milk Protein Shampoo Review. This Patanjali Medicated toothpaste comes in a simple tube packaging just like the original Patanjali ayurvedic toothpaste. It appears almost similar to the original one but is very different from inside. The original Patanjali ayurvedic toothpaste is dark brown and very weird in taste. But this is totally different and is blue in color with a cool atste with cooling sensation. Regarding the cleaning part, just a little amount of this dant cleanser is required to clean the teeth completely. Along with the cleaning, it gives cool refresh feeling without any weird taste like in any ayurvedic toothpaste. Overall I feel its a good medicated toothpaste to clean your teeth, but if I had to choose between Patanjali toothpaste, I would go with the original Patanjali Dant Kanti Cleanser. Though its little bad in the taste but it does its job of cleaning teeth extremely well along with keeping other problems at bay. Read Patanjali Saundarya Face Wash Review. 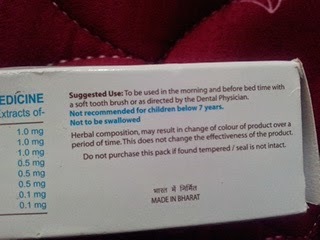 Medicated toothpaste from the brand Patanjali. Cant beat its original Patanjali Dant Kanti Cleanser. i read your blog thanks for give information about toothpaste and the Patanjali toothpaste is good for teeth.